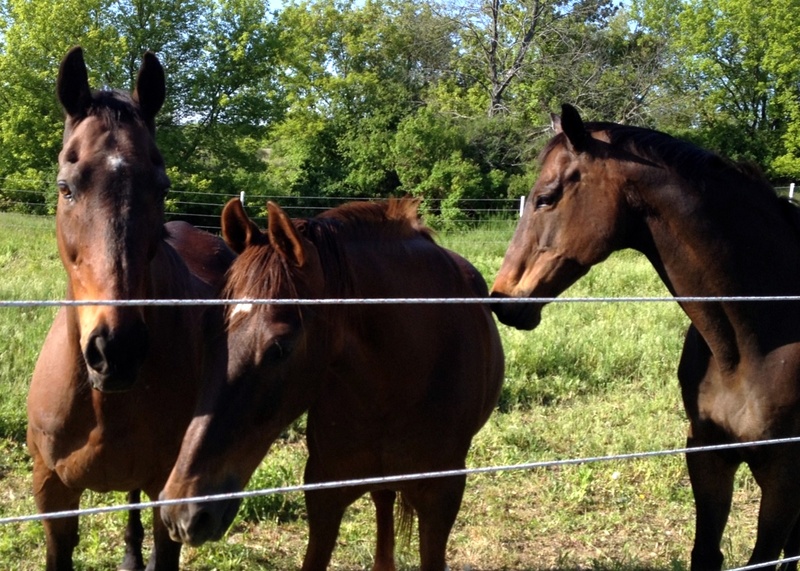 This picture of my retiree, Jag (far right) has nothing to do with tonight’s post. I visited him and his two amigos last weekend, They were all mugging for treats. Sweet boys. The last two weeks have been a strange and frustrating oddessy. It started when I dropped my stirrups a hole, and had to remodel my seat (and muscles). I had the great idea to help myself along by doubling down on the workouts, thinking that I’d suffer a bit but get over the hump faster. About a week before the show, I staggered into the barn for a lesson, which turned out to be a total waste of time, due to the fact that I had pretty much exhausted myself earlier that day. I apologized to Christy and told her I’d do my tougher workouts on non-lesson days. She said that was a good idea, but also suggested that I back off a bit in general. I decided to listen to her, and stopped all strenuous cardio work, because my legs just weren’t recovering. My muscles – especially my riding muscles, felt exhausted all the time. They were weak, and burning. 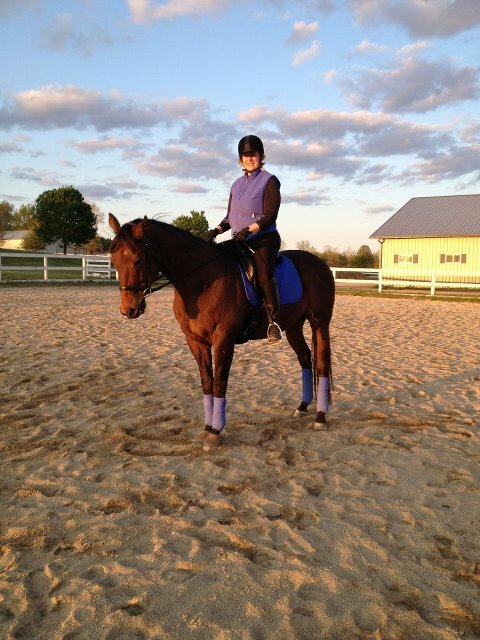 When I rode, I had very little endurance. It was ugly. The show itself, as I mentioned was physically exhausting. I have some new insight into my rides from Christy that I’ll share soon, but one key thing she noticed in the video of the rides is that I was double bouncing when I posted. And that problem persisted a couple days after we got home. While things have improved a bit this week (the double bouncing has been banished) I still haven’t been riding well. Saturday was total mess, as a friend stopped by to meet Derby, and he was super fresh and looky, and I just didn’t have the wherewithal to deal with it. Sunday started out the same way, so I put him on the longe. There was a lot going on that day – kids running all over blowing bubbles and riding Big Wheels, tractors and weedwhackers all over the place – you get the idea . Derby starte off running like an idiot, but I was soon able to get him listening. 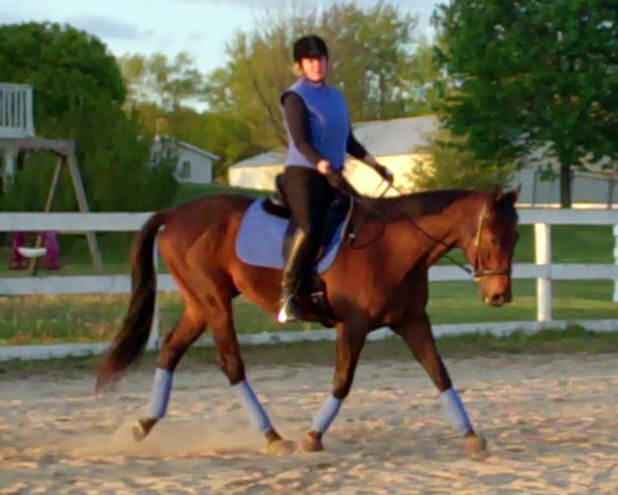 We did all sorts of transitions – walk, trot, canter, walk, halt, etc. and Derby really dialed in. He was listening well and even stayed focused during some pretty loud noises outside. We joined Christy & Liam and Donna & Boomer outside, and to my delight, even though he was presented with some totally new sights (kids on swingset, the aforementioned toddler on the Big Wheel) he was as good as gold. A few days ago, we talked about what was going on. My legs still felt terrible and the endurance and strength just weren’t there. So I put more protein and more carbs back into my diet. I took it easy for a few more days. I added a multivitamin that is also supposed to boost energy. I’ve loaded up on potassium rich foods. I’ve changed up my schedule eating what amounts to my dinner at around 4 pm. And finally, today, I felt better. And finally, today, I was capable of a decent ride. I’m eager to get back out there tomorrow. We’re aiming at another schooling show – and some redemption – at the end of the month! Don’t get through it. Perform it. A nice moment. One of several, for a change. Day by day, things are getting a bit easier with the new, longer leathers and subsequent position changes. I’m still a long way from being solid and strong in the saddle but I can feel improvement daily. 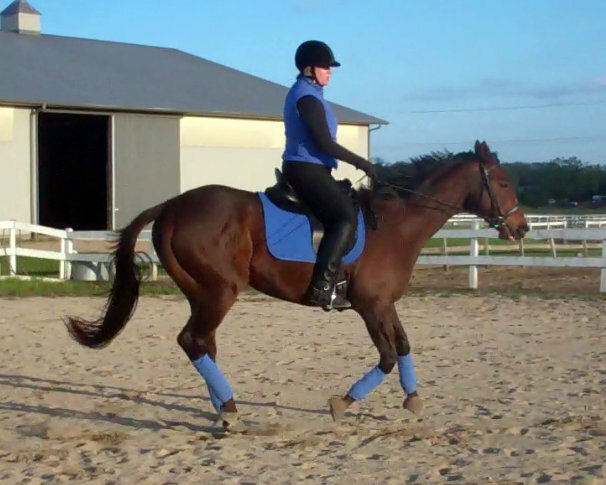 In today’s lesson, we made a show-ring quality trot a priority. Sounds easy, but for me, at the moment, it’s not. Putting the horse together, while maintaining a decent forward gait in a seat that still feels a bit precarious isn’t easy and the relative lack of stability gives me some heebie jeebies now and then. Wake up, Derby. We need to work hard on quality next, but my seat is coming along. The ride started out a little “eh.” I will freely admit that I’ve not been riding as forwardly as I should, due to the above mentioned issues with the new position. 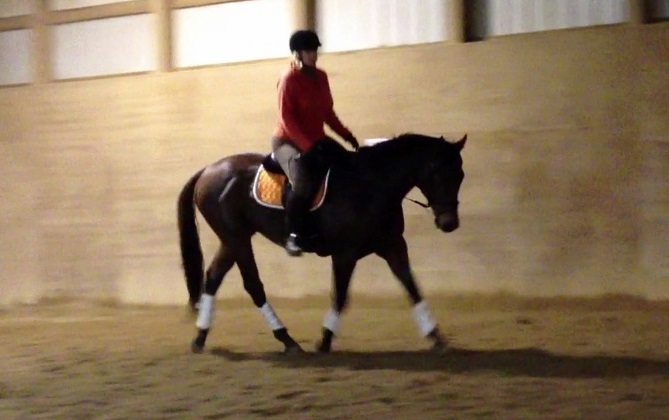 I have been doing some canter work though, and I needed it tonight, to get my pokey pony into gear. In reality, though, the pokiness wasn’t entirely Derby’s doing. When I straighten up, open up my hip angles and drape my calves along his sides, he goes forward nicely, I’ve been reverting to trying to drive with my foot hovering on the brake. A-ha. That gave me a new (and badly needed) perspective. I was just going through the movements, and it showed. I rode it again, this time with some purpose. It got better, especially as I paid attention to riding from my seat and legs, and staying out of Derby’s mouth, quieting my hands. Free walk. This is coming along. We then went through Intro B. Finally, things were clicking into gear. As I rode Derby more forwardly, Christy observed that he really started to carry himself. It felt great, and in addition to some nice roundness and contact, I also had his back up and his back end under me. 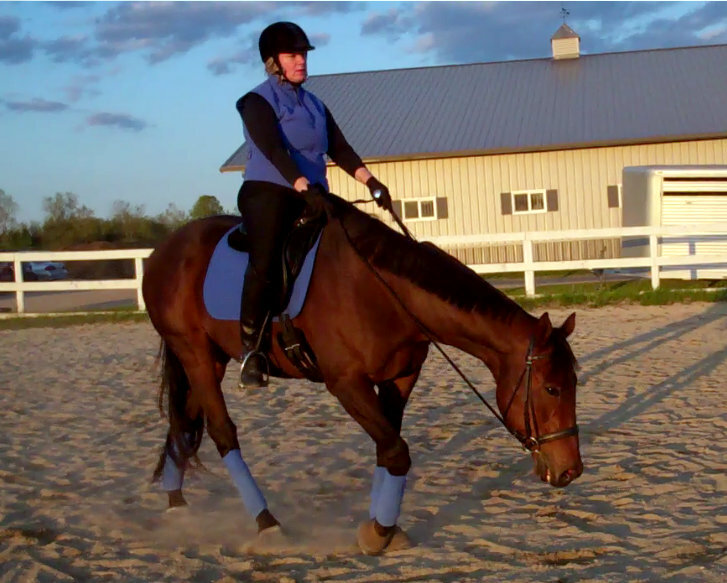 I love that feeling – when you have the horse packaged up, they feel so together, responsive and maneuverable. Overall, I’m finally able to produce some decent gait quality and keep it for more than just a fleeting instant. I hope we keep progressing! A friend complimented me on matching the clouds. Yep. Meant to do that. 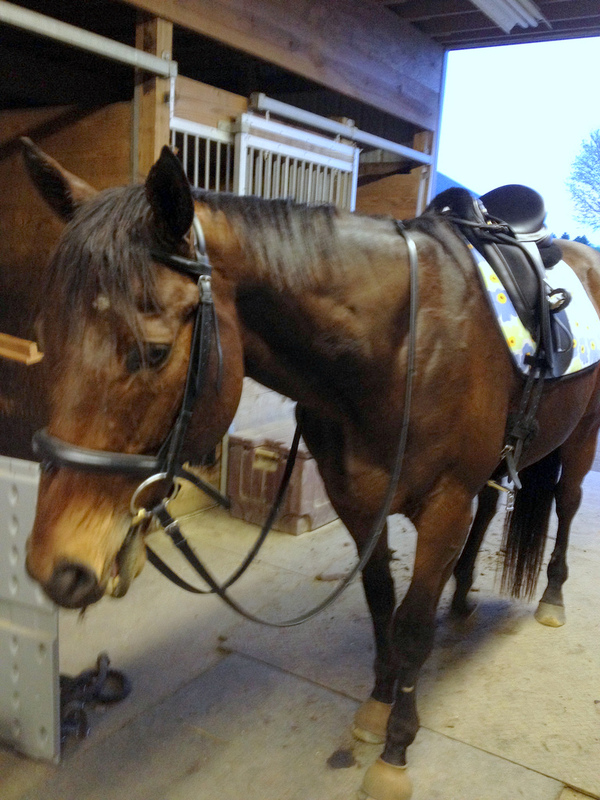 Sporting his new springtime saddle pad. 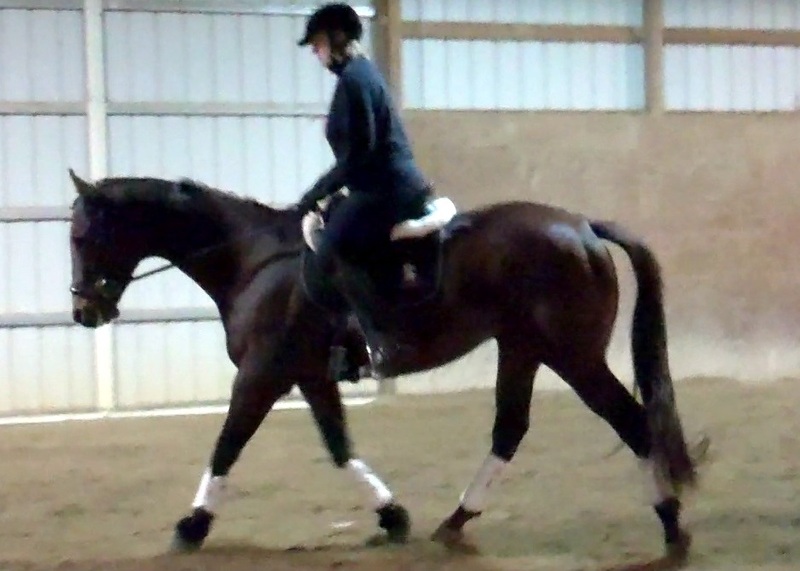 Tonight’s lesson featured more work on patterns, but with more trotting and fewer walk breaks. Derby continues to feel fantastic. His rider needs to get stronger! We’re jumping up to 45 minute rides starting on Saturday, and 45 minute lessons next week. 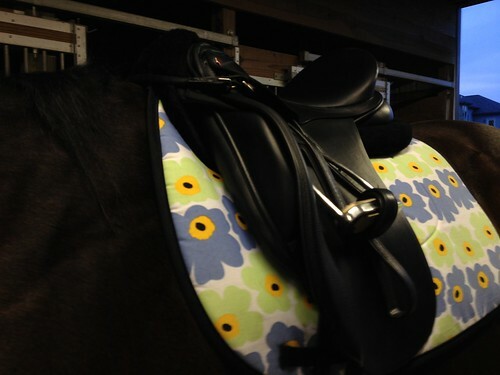 For fun I picked up a cute new springtime saddle pad today. How cute is this? 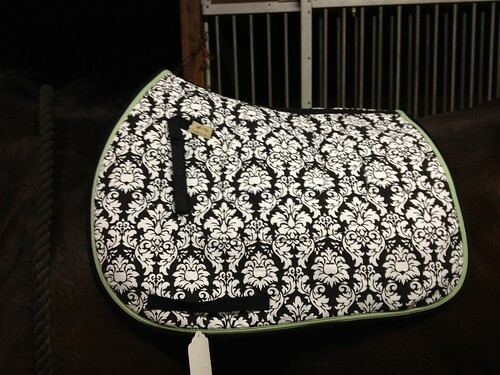 At this point I should admit that I actually bought two cute saddle pads today. They’re both AP pads – I wish they’d make fun dressage pads. Anyway. Here’s the other one. Crappy eq notwithstanding, Derby is going more reliably round, forward, and on the bit. As I mentioned in yesterday’s post, Derby is suffering some latent stiffness and muscle pain stemming from both the abscess and the fact that he really needs more conditioning, especially with respect to his hind end and his top line. At the moment, some muscles in his hind end are quite tense and tight, causing him to move stiffly, starting from his hips, and evidenced by shorter strides, and a back that doesn’t swing. He’s particularly reluctant to move out on his right hind, and Dr. Nicky said she suspects that he’s still off from using his hind limbs asymmetrically when he had the abscess. She prescribed Robaxin along with a program of longing and riding with the specific aim of stretching and strengthening those muscles. So, even though he’s not moving perfectly, I need to get on and really ride. This is what I need to really shoot for - getting him to step up under himself, while maintaining roundess and contact, to keep him over his back. This requires multitasking on my part. The imperative from the vet and the lingering effects of the Dover clinic have galanized me, and Christy, who is no longer inclined to cut me any slack. 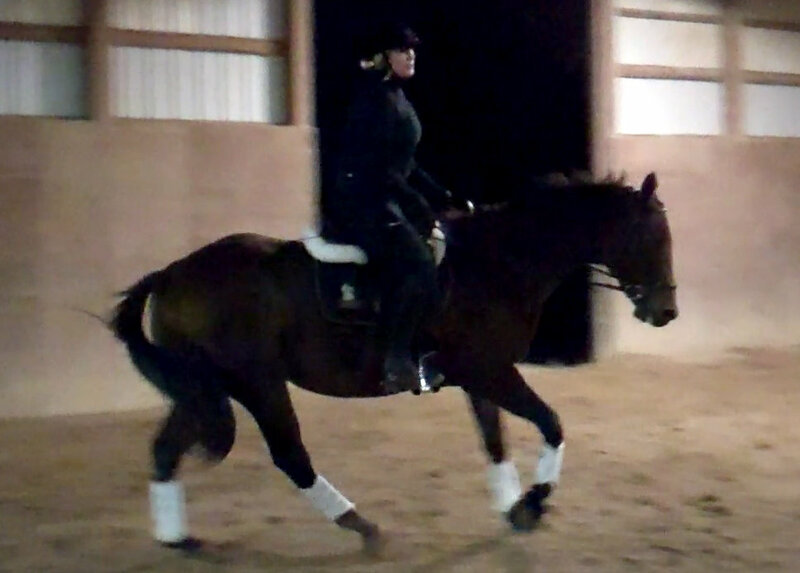 The lesson tonight worked a lot on leg yield and canter transtions, which were especially sticky to the right, requiring me to sit up, ride and require equine compliance and cooperation. Overall, I’m happy with our work tonight. The trot is more reliably round and forward. I’m getting better contact, though I may have to give some credit to a softer bit – Derby went very nicely in a fat KK, switching out from the thinner Myler comfort snaffle. And after a few attempts, I got a nice, immediate upward transition going right. That took some doing – that’s the lead we’ve been having difficulty with, most likely due to the abovementioned lameness and conditioning woes. We had no such issues going left – Derb picks that lead up right away. I have nine pages of notes and hours of video from the weekend’s clinic with Robert Dover, hosted by Wyngate Equestrian, and I really will try to synthesize all that info and share it with you. For now, I’ll stick to just a couple key things I took away from the experience. First and foremost, Dover focuses on the basics. He tested almost every rider’s connection with their horse, and proceeded with the lesson based upon what he observed during the exercise, no matter what level the horse and rider were at. One rider, who was mounted on one of the most fabulous horses in for the clinic (and that is really saying something, folks, there were truly some world-class animals there, including one that had been shortlisted for the Pan Am Games) that was purportedly schooling all the FEI work wound up working on getting the horse through and into the bridle honestly! It was an astounding lesson, from the standpoint that someone at that level could have such fundamental weaknesses. And this rider wasn’t alone. Another GP rider had similar issues with connection, and a third rider who was competing at fourth spent most of her lesson working on bend. It was fascinating watching Dover work with these three in particular, because I really wasn’t expecting to see people with issues to which I can really relate. The difference in the riders from the beginning to the end of their lessons was amazing, and one rider must have done extra homework, because her ride the following day was truly extraordinary, drawing applause from the auditors, myself included. In addition to his emphasis on the basics, Dover also emphasized perfection. “Walk perfectly,” he said dozens of times, going on to say that if your horse wasn’t through and on the aids at the walk, it wouldn’t be through and on the aids anywhere else. He required riders to follow his instructions precisely, and had them repeat the movement when it wasn’t up to his standards. As Christy noted in her first recap of the clinic, every rider rose to his challenge. In our chat about the clinic afterwards, Christy and I both noted that the charge to expect more of you, and your horse, was one that we would be taking back to Silver Fern. Finally, the last big take away for me was around forwardness and responsiveness. I *know* that you need your horse to be forward and attentive, willing to respond instantly to the subtle aids that make well-ridden dressage so beautiful. Dover emphasized the fact that how we ride trains our horses, and essentially, we have to ride them like we want to ride, and require them to respond. As I said, I have a lot more to share about the clinic, but now I need to talk about today. Derby’s abscess seems to have healed nicely, but he’s been short on his right hind (the abscess was in the left.) I had the vet out, and while she did support putting him on Adequan and said he would need to have his hocks done at some point, the issues I’m seeing are more about weakness and tightness in his SI region. She prescribed a course of forward, correct work. Which means that between what I learned from Robert Dover and what my vet says the horse needs, I need to make some changes. It’s been two weeks since I really rode, so I did a short lesson to get back into the swing of things. I told Christy to take no prisoners, and my formerly sweet trainer turned into a demanding taskmaster. But that’s what we needed, and we had a good ride – despite his reluctance to use his back end and step under himself, I was able to get him to do both, with constant coaching from Christy. Because the correct work is now an absolute imperative, I’m taking lessons each night this week, and on Saturday, and will probably repeat the same next week. I need to channel Robert Dover and get the perfect work Derby and I badly need.